Each Handrail Kit comprises of: Beech Hardwood Handrail, Stainless Steel End Caps (fitted), Stainless Steel Smooth Angle Mounting Brackets and Fixing Screws. Each handrail is available to order on-line in various lengths. If you need a custom length please don't hesitate in calling us. 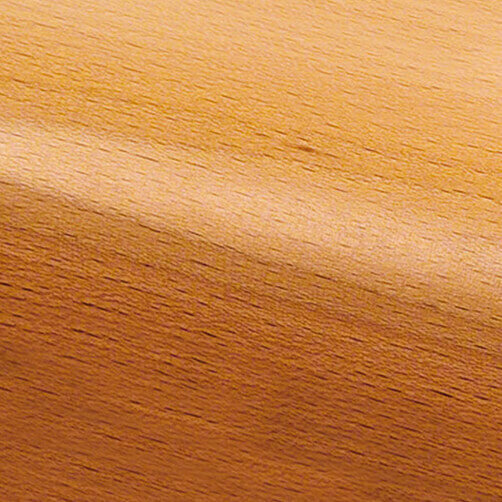 Hardwood Beech Handrail, Lacquered Finish. Complete with smooth angle wall brackets, supplied loose for positioning. Stainless steel end caps fitted. Mounting screws included (Please note: wall plugs not included). Available in 42mm diameter hardwood lacquered beech. 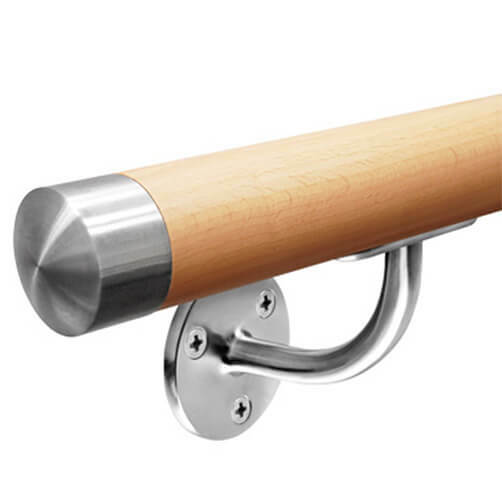 All timber handrail lengths of 3 metres and over are supplied in two equal sections and are designed to be linked together with a flush fitting in-line connector. Download and print our installation advice sheet for this beech handrail with smooth angle plate brackets. For a quick and easy installation you will need a few household tools: pencil, tape measure, spirit level, drill, screwdriver and suitable rawl/wall plugs. Our handrails are manufactured from natural timber, this sometimes results in natural flex or slight curves. Handrails will straighten once correctly installed. You can mount your handrail to the height that suits you best. Our recommended mounting heights are based upon the industry standard. If mounting your handrail on a flat level we recommend a height of 1100mm from the floor to the top of the handrail. For inclines we recommend a height of 900mm from stair to top of handrail. First we recommend that you mark out the bracket positions in pencil using a tape measure and spirit level onto the intended fixing surface. 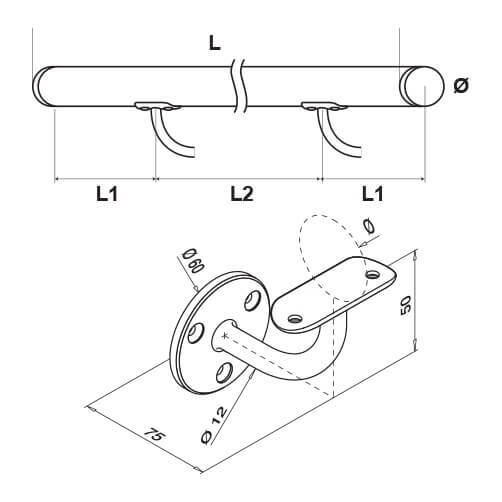 Position your end brackets 200mm in from each end of your handrail, any additional brackets should be placed equidistant between the two end brackets. 1. 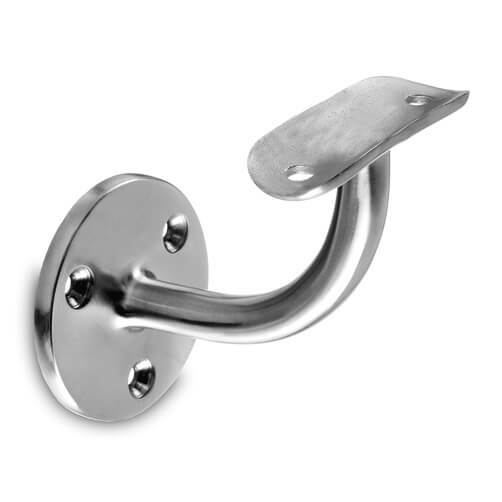 Drill pilot holes and insert your rawl/wall plugs and fix handrail brackets securely in place. 2. Position handrail in place and secure using the screws provided. FAQ, How do I join my handrail sections together? 1. Ensure the connection ends of the handrail tube are clean and free from dust and debris. 3. Allow adhesive to set (adhesive setting times are dependent on ambient temperature). The pre-fitted rail end caps outer diameters do not precisely match the beech rail outer diameters - the beech rails are a slightly larger diameter. Also the caps are fitted off-centre with respect to the beech rail. As a consequence there are 'lips' around part of the circumference where the caps are attached to the beech rail (both ends). This gives a poor look and feel at the rail ends. The same issue affects the central rail joint to a slightly lesser extent. However an additional issue with the central joint is the amount of play between the stainless steel spigot and socket. I haven't yet glued the two parts together but when checking a 'dry' fit the play in the joint will make it very difficult to ensure that the glued assembly is straight and doesn't end up with a curve that will be extremely obvious when mounted to the wall. I am very disappointed with this expensive purchase - I expected a much higher quality finish product than that provided. Very pleased. Stylish and matches my decor. Easy to fit. Excellent product and service, and delivered speedily. Excellent product & delivered on time to my instructions. Thank you. Good quality product, well made and competitively priced. Solid sturdy handrail that also looks good. Core product good. Hardly consistent with a premium product at a premium price were too soft metal screws, no rawl-plugs and late delivery following a polite (swiftly acted on) complaint. Very well made and high quality fittings!